We now offer this condenser again due to high customer demand, though procuring it gets harder and harder and, above all, the reason for this part has been long superseded by the existance of our alternativen regulator 7300.
again our advice: for use of our systems without battery our alternativen regulator 7300 is the much better alternative. Certain systems or environments demand a smooth DC voltage. Any alternator - and our systems are basically alternators - produces alternating current first. It gets rectified to DC but still inherits a certain and very variable frequency (depending on engine revolutions) which may disturb direction indicators, horns and sometimes even lights. 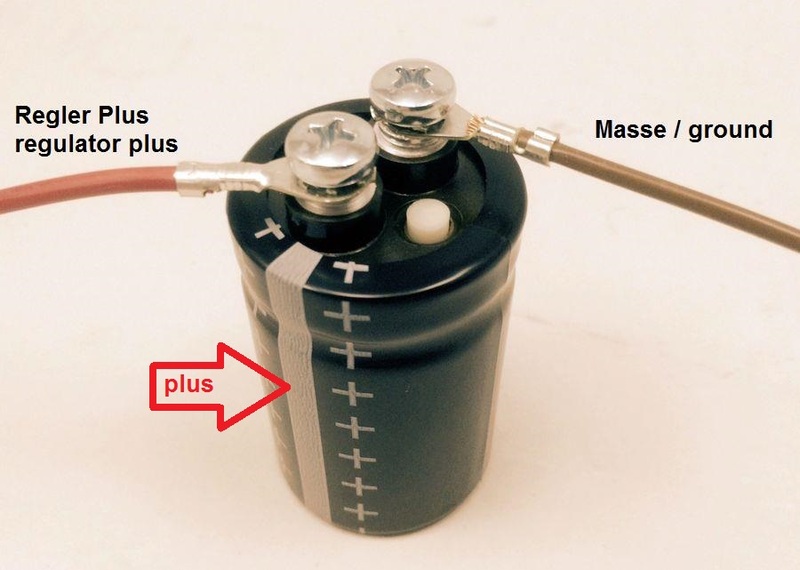 A battery is technically a large capacitor and solves the problem by absorbing that unwanted frequency, smoothing the current. If there is no battery in the system, you will need a condenser in the following cases (and only in those cases). Is there no light on, the condenser will gather all produced voltage (which could be up to 50 volts). When you than switch on lights this overvoltage may blow your bulbs. Has the light been switched on before starting the engine (sure as there is no battery it will not shine) than there is no problem. Note: the condenser is NO voltage storing device, even though it gets fitted in place of the battery. NO parking light would function, not one second. The condenser has (like the battery) a plus and a minus terminal and gets connected as if it was the battery. In case of doubt, connect it to the regulator, plus to plus, minus to minus.